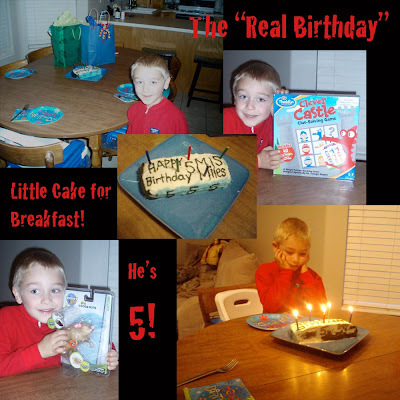 I can't believe my son is five years old! It really does go by fast, and he's looking so old to me these days. Today is his actual birthday, but we started celebrating on Saturday morning, where he got a new shirt for the day and got to "open" his bike. 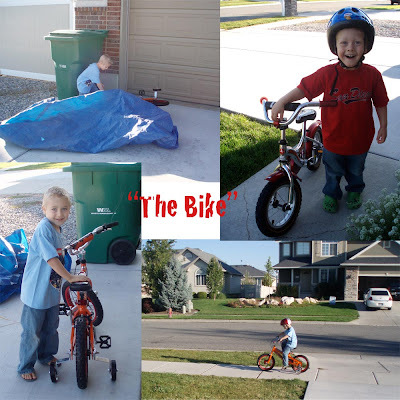 E was even more excited to get his old bike, which they have been fighting over for months now. We had a party for him that night with some family. He worked hard to make a banner welcoming the guests to the party. 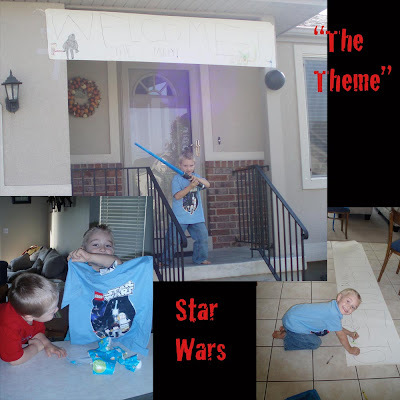 It featured Yoda and Darth Vader stabbing obi-wan-ken-obi. 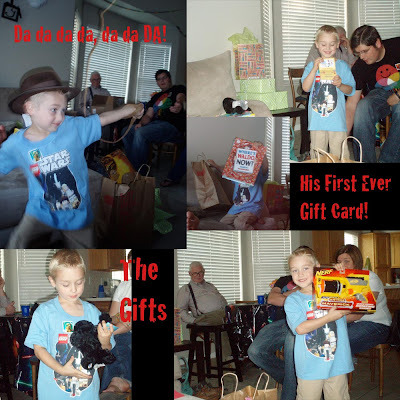 He loved all the star wars themed stuff and we had a great time. 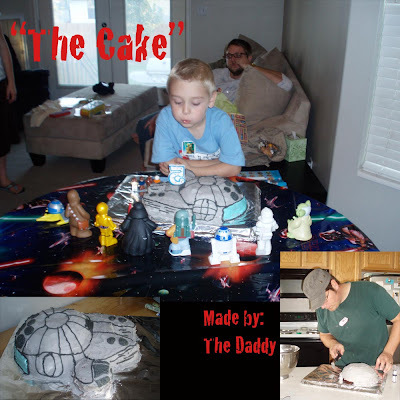 He was thrilled & spoiled with great gifts and an awesome millennium falcon cake made by the DH. This morning we had the traditional cake for breakfast and he opened a few small gifts from us. Today we are doing whatever he wants, which oddly enough includes school, story time, all the stuff we'd probably do anyway! Happy birthday to my biggest boy! 5 Days (or more) Left! I'm getting close to the finish line and am to the point where this baby is keeping me up more at night than he will be after he's born. I can't believe even a newborn is getting up every HOUR like I am now. Here I am yesterday at 39w 1day. I thought to pass the time I'd post some more of the "fun" parts of having a baby. Here is the 1/2 of the office that is his room. It will be for changing his diapers and the clothes are in the closet in here. I'm sure the crib will be great for storing stuff in ;) I didn't really get much that's new for the nursery decor except the vinyl on the wall and the light switch cover, the rest was all made in 2003-2004 for M.
My mom (the overachiever from whom I came) has made 2 ADORABLE quilts for baby N. Here they are in all their cuteness. I showed her the David Walker Robot Fabric I was drooling over and she made the robot quilt out of it. The other is a cute panel she found at a local quilt shop. It's nice warm fuzzy flannel on the back. If baby N turns out to be a girl, I have been instructed to give them back and she'll make some girly ones. Pretty sure he looked VERY boyish in that ultrasound, though! So now that the primary program is over, baby N can come out, right? 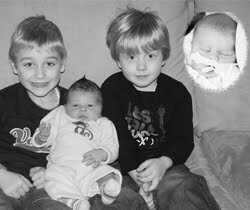 Oh wait, I have to still have a birthday party for M.
I know, I know, he'll come when he's good and ready, which will probably fall somewhere near my due date, if past history is the indicator. In the meantime, wish me luck on attempting to put on pants, reach the bottom of the washing machine, tie little boys' shoes, and sweep my muck into the dustpan myself. This is what E keeps calling where we went on Monday night. (It was the Utah State Fair.) He says he wants to go there on his birthday. Good luck with that in April. They remembered how much fun it was last year and were so excited to go again. They of course LOVED the little hands on the farm. It is seriously the cutest thing ever. The baby pigs were a highlight as well, even though M says the goats were his favorite. I liked the yummy dinner I didn't have to cook (thanks mom and dad!) and the fact that it was not hot. 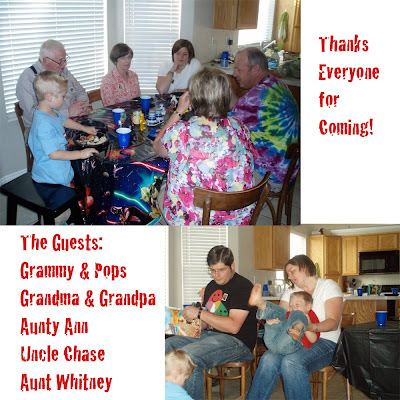 (Although it was pouring rain most of the time) It was fun to have Grandma and Grandpa there and was a fun family night! This is from today during school, we were learning how to read a recipe and made edible playdough. This week has been about: Tall Tales continued, Cooperation, Recipes and abbreviations, and story time today was about clocks and watches. They got to look at broken watches to see what was inside, which they really enjoyed. Tue- Feelings, puppet show, made feeling faces and came up with situations, stations, made cookies. Thurs- Homophones & Riddles, read squirrel nutkin, examples of homophones, illustrated riddles, attended Library story time. Tue- Tall Tales, Read about Paul Bunyan, discussed exaggeration, made their own tall tale. I have included it below. Today- “The Force”- Gravity and Newton, did experiments with gravity, inertia, and magnetism. Had new stations set up. Ate Newtons apple when we were done. Going to story time as well. We also work on either number, letter, cutting, or other various workbooks every day before the lesson but after songs, etc… It lasts from 1-4 hrs. usually two. Well, they're not hung yet, but I'm ready to go when the time comes. After M was born, I decided to make him a stocking and bought enough of this blue felt and the coordinating flannel for the back to make 3 stockings. I made E's after he was born and I just didn't think I'd want to be stressed with N's after he was born, so I used up the last of the fabric & felt and finished his today. Either I can't have any more kids, or kid #4 will have to have a different color scheme. Maybe if it was a girl it wouldn't be weird to be different. Anyways, you blog readers will have to have the blurred out version of the names, sorry.